It’s been a while since I’ve seen an animated kids movie that I thought was pretty good. I think Rise of the Guardians is one of the better ones I’ve seen, and this one will definitely be making its way onto my DVD shelf in the near future. I think the reason why this movie didn’t get as great ratings as Wreck-It-Ralph (2012) sort of makes sense. Assuming that the only people rating the movies online are the older crowd dragged to the movie by their children, the lack of back-in-the-day video game references and inappropriate jokes can make for a pretty boring movie for a parent. For a kid, however, I think this movie is perfect. Cheesy as it is, it has some pretty nice messages too. Like believing in yourself, or the fact that it’s okay for kids to just be kids. The only real negative criticism I have towards this movie is the fact that there’s a couple snowball fight scenes where kids are throwing snowballs at the heads of other kids. Now, I’m all for a good snowball fight, but teaching kids that it’s funny and okay to peg someone else in the head might not be the smartest idea—especially on the off-chance a snowball a kid throws ends up actually being an iceball. While I’m sure no one intentionally tries to chuck a ball of ice at another person’s head at full force for fun, it’s probably best not to chance it, just in case. Aside from that minor detail though, I thought this movie was actually pretty awesome. For one thing, it puts together a cast of characters that seems like the most random ensemble ever, but the movie really makes it work. Also, this is one of those movies where I think I actually liked the “bad guy” as much as the heroes. Of course, knowing that the voice acting was done by Jude Law might have had something to do with it, haha. Need a quick summary of the story? Here’s one…in my own words, anyway. I’ll try not to spoil the story too much. Pitch Black (also known as “The Boogeyman”) is planning on taking over the world with what he does best, and that’s instilling fear. 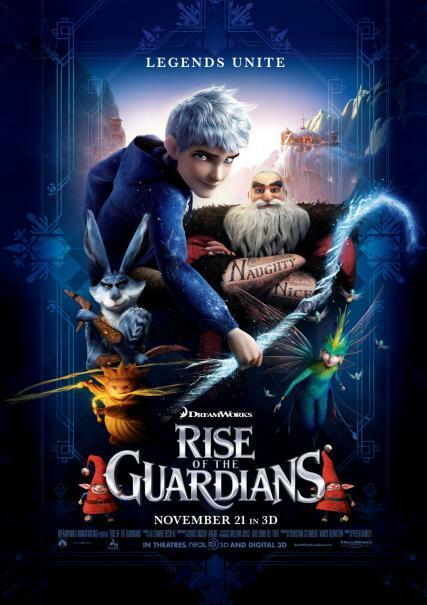 The Guardians, whose main job is to protect children, must work as a team to keep Pitch’s vision from becoming a reality with the unlikely assistance of Jack Frost. There’s honestly so much more detail that I want to add to that, but I think I’d be giving away too much of the story at that point. If you’d like a better idea, I’d suggest poking around IMDB and Rotten Tomatoes, and maybe even checking out a trailer or two. (I would actually avoid using Wikipedia for information unless you’re actively looking for spoilers, as lately I’ve noticed that the database has become the perfect place for finding thorough plot spoilers for most movies out there.) I will say though, this was one of those movies where I thought it actually delivered what the trailer promised, and not to mention it left me personally wanting a bit more, which I think is both a frustrating and wonderful feeling to leave the theater with. I thought the animation in this was really well-done; one of the few films I’d actually recommend seeing in IMAX at the very least, even if you decide against the 3D. Although, watching it in 3D isn’t so bad either, especially for the Sandman bits where he’s working with the dream sand. I thought that was pretty spiffy. I watched a few previews prior to seeing this movie where they showcased the animated sand, and maybe this is my inner child speaking, but I kind of wished I could play with the sand while watching “Sandy” do his thing. Another thing I really enjoyed—and wish they really spent more time embellishing—is Jack Frost’s back story. I really would have loved to see more of an extension there. Who knows, maybe they’ll have some deleted scenes on the DVD release to look forward to with just that. In fact, I’m really hoping that this movie comes with a lot of extras come its DVD release. Is the story predictable? Sure. Are there really cheesy/corny jokes, yeah, of course. Is this going to be everyone’s cup of tea? Probably not. For those who prefer kids movies to have references littered throughout that only adults are supposed to understand, this probably isn’t your kind of kids movie. For those who like to see kids movies through a “child’s lens,” as I like to call it, I think it’s likely you’ll enjoy this one. This one I would not necessarily call a classic, but I thought it hit all the key things I look for when I think “kids movie.” Again, the only part I wish there had been more of was Jack Frost’s back story, but hey, I suppose some things are just meant to be left to the imagination.